1Department of Physics, Bangalore University, Bangalore-560056, India. 2Inspire Institute Inc., Alexandria, Virginia, 22303, USA. 3Department of Physics, Kuvempu University, Shankaraghatta, Shimoga-577 451, India. Recent years have witnessed revolutionary improvement in the production, manipulation, characterization and quantification of multiatom (multiqubit) states – because of their promising applications in high precision atomic clocks, atomic interferrometry, quantum metrology and quantum information protocols. In the characterization and quantification of non-classical atomic correlations, two concepts namely, spin squeezing and quantum entanglement emerge. While spin squeezing originates from the uncertainty relation between atomic collective angular momentum operators, entanglement is a peculiar phenomena arising due to superpositions in the multiparticle Hilbert space. Here, we outline different quantitative measures of spin squeezing and discuss the intrinsic relation of spin squeezing with quantum entanglement in multiqubit systems. We construct the equations of motion corresponding to pump and signal (Second Harmonic) fields in a second harmonic generation. By using a simple analytical approach, we obtain analytical solutions of those field operators up to the cubic orders in the interaction constant. In an appropriate limit (truncating the solution up to the second order in the interaction constant), these solutions lead to the existing solutions under short time approximation. The present analytical solutions are exploited to investigate the squeezing and the antibunching of photons of the input coherent light coupled to a second order nonlinear medium. We report the squeezing and antibunching effects of the pump field even for the solutions up to the second order and hence the present results are consistent with those of the earlier results. However, for the second harmonic mode, we report the squeezing which is ruled out in the earlier investigation. We describe the properties of squeezed atomic states, the so-called spin squeezed states. They are crucial for the precision spectroscopy such as population spectroscopy. Also, spin squeezed states are entangled which is the backbone of quantum information. Thus spin squeezing makes an important area of research. We discuss the production of these states by a few quantum optical interactions. Entanglement dynamics of initially entangled three atoms is considered when one of the atoms is made to pass through a cavity. Initial state of the atoms is taken to be a W-type state and the cavity mode is prepared in a Fock state. Interaction between one of the three atoms and the cavity is governed by the Jaynes-Cummings Hamiltonian. An approximation for the time of entanglement sudden death is obtained. Interaction Hamiltonian between the atom and the cavity mode is extended to include nonlinearity and the effect of nonlinearity on the entanglement sudden death is studied. We investigate the generation of entanglement and atomic squeezing for a system of two two-level atoms enclosed in both dissipative and non-dissipative cavities specially focusing attention on the relationships between concurrence quantifying entanglement and various squeezing parameters measuring atomic squeezing. For the dissipative case we consider a bad cavity with a broadband squeezed vacuum injected into it through one of the mirrors. We discuss the role of two-photon coherence and populations (in collective atomic states) in the generation of entanglement and atomic squeezing. Nonclassical features displayed by a radiation field propagating in a non-linear medium have evoked much interest in the context of both quantum dynamics and quantum optics. We consider the dynamics of the expectation values of appropriate observables in some simple models arising in quantum optics, to bring out the signatures of special features such as revival phenomena in the propagation of wave packets in nonlinear media. In parameter regimes in which revivals are absent, the ergo dicity properties of observables have been examined through the corresponding recurrence-time distributions. The roles played by the degree of coherence of the initial state and by quantum entanglement are highlighted by considering representative states. The efficacy of cat state in Heisenberg limited measurements is explored, in close contact with available experimental setups. Subsequently, it is shown that a specific entangled cat state can substantially improve the accuracy of the desired quantum metrology. We also demonstrate the possibility of physically realizing this state in dissipative systems. We show that in the Thomas-Fermi approximation, all the collective excitations of a pure binary-phase Bose-Einstein condensate (BEC) in a spherically or axially symmetric trap can be obtained from those of a single-component condensate by a simple scaling. Furthermore, several accidental degeneracies will appear in the spectrum due solely to the interaction between the two components of the binary condensate. We identify them and find conditions for their occurrence. A new scheme to realize simultaneous negative permittivity and permeability in a three level closed system with incoherent pumping via spontaneously generated coherence (SGC) has been presented. The negative refractive index can be achieved in a band of frequency range. The position and the band of the frequency region of negative refraction can be manipulated by controlling the incoherent pump rate. We achieve FOM =5.356. We have studied the group index in the negative refractive index region and have shown that the group velocity switches from superluminal to subluminal mode in this region of negative refraction. Results of the present study discuss the competition between electromagnetically induced transparency and Raman processes in an inhomogeneously broadened medium of three level atoms in a configuration. We demonstrate how multiple Raman processes are generated due to the depletion of probe intensity at low density regime. We also show how the Stokes field becomes dominant at higher atomic densities due to depletion of both the input fields. We investigate theoretically electromagnetically induced transparency (EIT) in a medium consisting of four-level atoms in tripod configuration and interacting with three laser fields, i.e., a weak probe, a strong pump and a strong control beam. Using Master equation approach, analytical results are obtained for the susceptibility of the medium and absorption spectrum of the weak probe in the presence of strong pump and control fields for both stationary and moving atoms is discussed. The pair of EIT resonances arising in such a medium is investigated with an objective of controlling their linewidths and existence of an ultra narrow absorptive resonance is demonstrated. We have shown earlier that hyperfine spectroscopy in a vapor cell using co-propagating pump-probe beams has many advantages over the usual technique of saturated-absorption spectroscopy. using counter-propagating beams.The main advantages are the absence of crossover resonances, the appearance of the signal on a flat (Doppler-free) background, and the higher signal-to-noise ratio of the primary peaks. Interaction with non-zero-velocity atoms causes additional peaks, but only one of them appears with in the primary spectrum. We first illustrate the advantages of this technique for high-resolution spectroscopy by studying the D2 line of Rb.We then use an acousto-optic modulator (AOM) for frequency calibration to make precise hyperfine-interval measurements in the first excited P3/2 state of 85, 87 Rb and 133Cs. We describe a new experiment set up to study ultra-cold atoms of 2 isotopes of Rubidium and 3 isotopes of Potassium close to and well within quantum degeneracy. One of these, Potassium-40, is a fermion. The set up with a 2D+ MOT source and two 3D MOT chambers incorporates an atomic fountain extension with multiple probe points for laser interaction. A novel aspect of the set up is the ability to trap and probe a few atoms, down to a single atom, with ultra-low kinetic energy, to study atom-atom correlations including spin-statistics connection. Some preliminary results on the deep sub-doppler cooling of Potassium are presented. Photon correlation spectroscopy or the intensity correlation spectroscopy is an important tool to study dynamical systems in many branches of physics and also for testing the quantum mechanical properties of a given photon source. We have studied light scattering of an optical vortex through a rotating ground glass using photon correlation spectroscopy. The results show that the intensity correlation curve for an optical vortex decays faster than that of a Gaussian beam of a He-Ne laser, scattered through the same rotating ground glass. 1Light and Matter Physics Group, Raman Research Institute, Bangalore. We describe in this paper our experiments with a tunable microwave cavity resonator at 3.035732 GHz. The central frequency of the cavity is chosen to be resonant with the ground hyperfine states of Rb-85 and connects the 5S1/2 F = 2 state and 5S1/2 F = 3 state through a magnetic dipole transition. The cavity design parameters yielded a high Q-factor of 1790. Using this cavity, we have performed Electromagnetically Induced Transparency (EIT) experiment with atoms coupled to both microwave and optical fields inside the cavity. We find evidence of spectral narrowing of EIT signal when the cavity field is switched ON. This may signify transfer of coherence from the microwave to the optical domain. 1Radioactive Ion Beam Group, Variable Energy Cyclotron Centre, Kolkata 700 064, India. Bhabha Atomic Research Centre, Mumbai 400 085, India. We demonstrate a novel scheme for wavelength modulation spectroscopy utilizing a sub-natural linewidth (< 2 MHz) electromagnetically induced transparency (EIT) signal generated in the Cs vapour medium. Instead of conventional current modulation of pump laser, in the present scheme the modulation is introduced externally to improve the noise spectrum. The modulation is then transferred to the probe laser through atomic coherence. Frequency stabilization of probe laser is done by electronic feedback using first and third derivative of EIT signal obtained through phase sensitive detection. The stability analysis is carried out by following the frequency noise spectra and Allan variances. The scheme utilizes home-built lock-in amplifier, control loops and other electronic sub-systems and provides a simple and elegant way to obtain robust frequency offset lock precisely tuned to the Cs clock frequency (9.19 GHz). Using different kinds of Rb vapour cells optical pumping effect is analysed by observing fluorescence spectroscopy. We represent the variation of optical pumping with cell buffering and cell miniaturization. We have used an extremely thin cell (12 ?m) in this purpose. Theoretically simulated spectra are also compared with experimental spectra. Our theoretical analysis and experimental results give basic information for further investigations on coherent spectroscopy of atoms in buffered and miniaturized cells. We have employed a home-built quadrupole Penning trap to confine a pure electron plasma under low magnetic fields (a few hundreds of gauss). The device is used for studies on perturbations that lead to electron losses from the trap. We describe an electronic detection technique that is used to measure the storage time at different magnetic fields. We have observed oscillations in the trapped electron number before decay at about 120 ms. The decay time remains unaffected by the magnetic field suggesting the presence of anharmonic perturbations in the trap that have a significant influence on this time. In order to characterize the perturbative environment within the trap, we have measured the higher order motional resonances of the electron motion resulting from couplings in the electron's degrees of freedom. Such measurements enable us to estimate the higher order multipoles present in the potential in the trap. 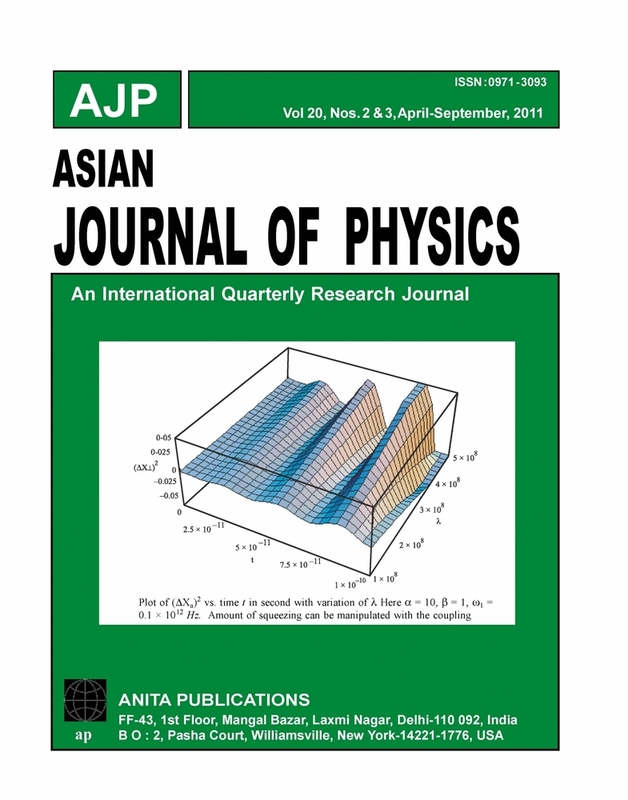 Non-linear effects manifesting as anharmonic oscillations of trapped ions in the Paul trap, has been studied both experimentally and by theoretical simulations. For a single-species ion cloud in an actual Paul trap the imperfections of the trap electrodes are the main source of anharmonicity which manifests itself in the rf resonance signals of the ions. Important information of the trap configuration could be extracted by analyzing the features of the line shape. A new method has been has been proposed for evaluating the octupole deformation parameter C4 (one of the trap structure coefficients) and has been compared with that described by earlier workers.